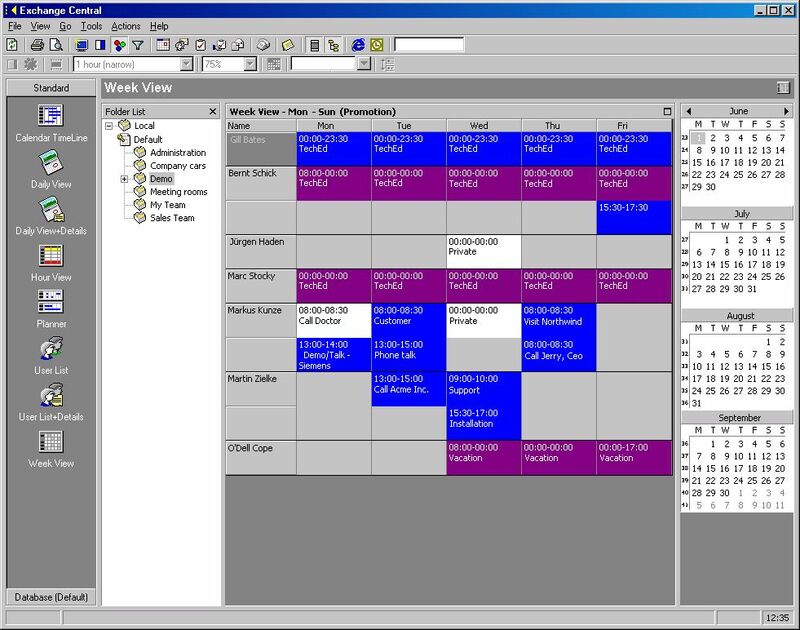 Our clients based group calendar, which allows group scheduling of employees, resources and conference rooms. Exchange Central is a planning tool for Outlook users, who want to control and manage many Outlook calendars and/or Outlook resources. Exchange Central improves as well the collaboration as the communication level between employees and the different departments in your company/organization. If you miss the consolidated overview over many or selected calendars/Outlook resources then Exchange Central is the tool you’re looking for. GALsync’s primary purpose is to synchronize address lists and objects between Active Directory environments thus making it easier for two different company’s staff to communicate with each other. The tool accomplishes this by providing each organization with a Global Address List that includes each company’s staff’s email address and associated information. In addition to assisting with GAL synchronization, which is one aspect of GALsync, it can also help synchronize free/busy information between organizations. Usability scenarios include the following: Multi-Forest Company Deployment; Company Mergers or Partnerships; Migrations. GALsync allow you to choose the objects you need, select all objects or subsets of objects to export to the other AD, use multiple domains, choose your transmission protocol, use managed codes and also allows secure data transmission. With Resource Central, you can order all the associated services when you book your Outlook resources. Room Finder helps you locate the proper resource and allows you to select from a customized list of services available. No need to chase down catering and audio visual equipment for your next meeting, Resource Central manages everything for you. Resource Central integrates with Outlook and Exchange and offers you the opportunity to order all associated services when you schedule a resource. Your business relies upon the performance and availability of your servers to help keep productivity at peak levels. If you’ve experienced an unplanned server outage, you can probably attest to that. With Simpler-Webb Managed Server, you can feel confident knowing your servers are monitored and maintained 24/7/365. Our team of certified experts handles day-to-day tasks, scheduled maintenance and conducts periodic health checks, helping you to lower the total cost of ownership. We also evaluate your systems configuration and memory usage, flagging issues before they become problems. It all adds up to more free time for you to focus on staying productive. Synchronizes appointments from user calendars to public calendars and back. Filters in the software make sure that only the appointments that are relevant to that particular group calendar become visible publicly. - Setting up one mandatory category list and colors for all exchange users so everyone uses the same colors. - Admin users (managers) can create one single item in a groupcalendar that replicates to all user calendar and they can not remove that from their calendar. - No software install on client computers, does not have to be installed on the exchange server, works with hosted exchange too. - Flexible licensing starts at 20 cents per calendar per month. Organization-wide Agenda overview for Microsoft Exchange and Outlook. Agenda/X extracts Outlook calendar information stored on the Microsoft Exchange Server and makes it available on the company intranet. Users can get an overview of all the appointments using their web browser. A server-based calendar agent regularly copies all Outlook appointments into a central database. Microsoft Internet Information Server publishes this information as a set of tabular overviews on the company intranet or internet site. GeniusConnect will synchronize Outlook/Exchange data with any relational database that supports ODBC (MS Access, mySQL, MS SQL Server, Oracle etc). An Outlook folder (Calendar, Contacts*, Mail, Journal, Notes and Tasks) can be linked to a database table. You can use your own table structure and define conversions for columns with data types that are not compatible with an Outlook field. It is possible to use GeniusConnect on multiple Outlook or Exchange folders and multiple databases. GeniusConnect supports synchronization of the following Folder types: Microsoft Outlook 2002/2003: Calendar; Contact; Mail; Task; Journal; Note. Microsoft Outlook 2000: Contact. LOOK is an Outlook group calendar add-on that integrates with Outlook to offer the user group calendar and scheduling overviews. Benefits are instant access to overviews of the "whereabouts" of groups of colleagues and bookings of resources, such as meeting rooms, real-time views (in contrast to all Outlook versions) with optional real-time service, features to streamline Outlook group planning and scheduling, extended meeting booking, color code and filter appointments, search multiple calendars, resolve conflicts, export group calendars to HTML, Word, Excel, and more. See also our web-based solution LOOK.WEB. Frustrated with Outlook Calendaring? Exchange Central makes up for Outlooks shortcomings. Exchange Central gathers the appointments from other Outlook calendars and gives you several comprehensive methods to view the "whereabouts" of groups of your colleagues. Offers the capability to create HTML pages of group calendars, export appointments to Word or Excel, as well and color code and filter appointments. Integrates with Outlook or use the web client for remote users or for use with OWA.